One if the simplest, and most effective ways to convey to shoppers the quality of you brand is by using leather labels and patches. 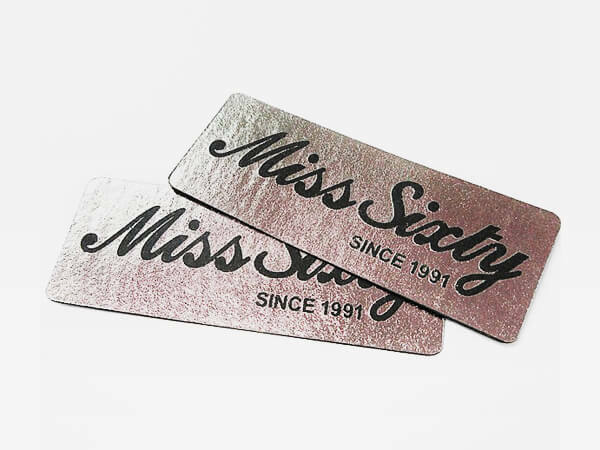 A smart alternative to traditional woven labels, they give your line an air of authority and craftsmanship while allowing your creativity to shine through. Leather is synonymous with superiority, making your line synonymous with excellence and putting it above the competition. 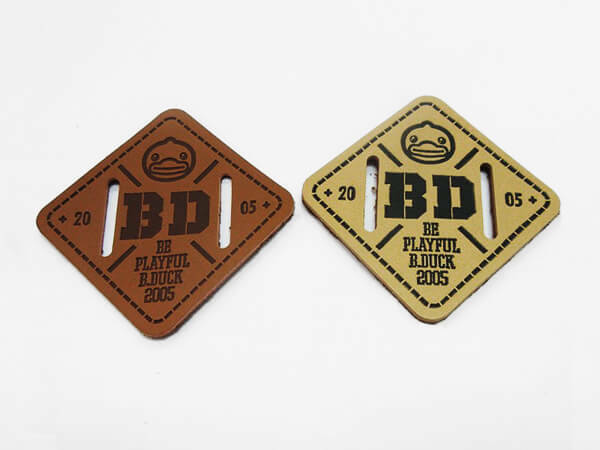 Leather patches are unique, which translate to increased sales and brand loyalty for you. Real leather tends to vary in terms of color, so no 2 labels are alike. This gives your line a custom look that can’t be duplicated. Synthetic and suede offer another level of uniqueness, allowing for a wider range of colors while still offering the look and feel of real leather. Soft and supple, they can be placed on an endless number of garments, from jeans to jackets and hats, and are the top choice among high-end designers. Here at Sun Tat, we can create custom, one-of-a-kind leather labels and patches that speak to consumers. From embossed to silk screen, there is no end to the kinds of leather labels we can provide you with, helping to take your line to the next level. Using precision and skill, we can make leather labels in any size, shape, or color, bringing your visions and ideas to life. Just like the labels we produce, our work is synonymous quality and integrity, and is a step above the competition. Leather patches are a statement piece, giving your brand an instantly recognizable identity that silently and eloquently speaks of excellence. Using a variety of colors and techniques, they can be made to adorn and garment you choose. Leather labels can take any collection and give it a designer feel. While traditional leather comes in natural colors, suede and synthetic options offer you the option of using almost any color without sacrificing quality. They can be printed upon using embroidery, or embossing, for distinctive looks that fit any line and price point. Durable, yet polished, they give longevity to your items and can withstand multiple washings and handlings. They are meant to be visible and work best on the outer portions of jeans, hats, shoes, shirts and jackets, so they jump out and grab the shoppers’ attention. A quality leather patch denotes good craftsmanship and lets consumers know you take pride in your collection. It also allows you to get out your brand’s message- speaking to shoppers without saying a word. Embossed Leather Patches: Embossed leather patches are a real eye-pleaser and make shoppers take notice thanks to their unmistakable “burnt” look. With embossing, the logo or slogan looks as if it has been branded or burnt into the label, for a sleek look that goes with sporty or elegant brands. Using molds, embossing can create a sunk-in or 3D effect and can be done on real and imitation leathers, but most often it is done on natural tones (browns and blacks), for a weathered, distinguished looks. Embroidered Leather Patches: Using embroidery on leather patches gives them a hand-sewn, authentic look that conjures up images of hand-tailoring and old world finesse. Using threads of varying thicknesses, a logo or catchphrase can be sewn on by machine in any color. Embroidery is great for edgings and definition, and can be done on leather and suede. 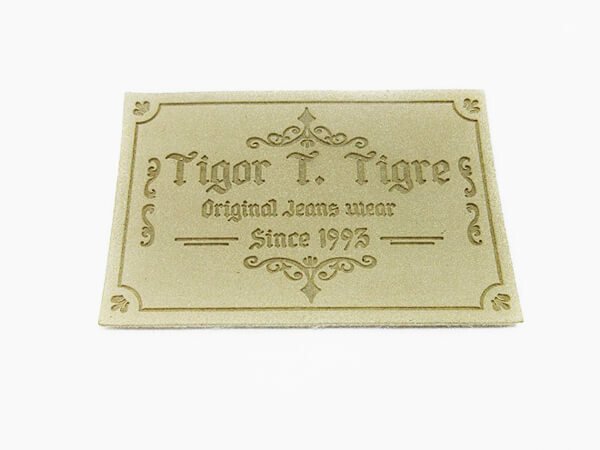 It looks especially nice on jean labels, giving the impression of being sewn “onto” the fabric. Silkscreen Print Leather Patch: If you really want a patch that stands out silkscreen leather patches will get the job done. It can be done with embossed or debossed leather, giving the patch a shiny, silky sheen that is smooth to the touch. With silk screening, dyes and a silk screen are used to overlay and create your design, bringing depth and elegant nuances. There is an abundance of colors to use and they look great on jackets and tees. Leather Patch with Heat Seal/Velcro: If you need a leather patch that can be moved from garments, or are using them for a uniform/team line, then patches with Velcro are a smart choice. Using leather or imitation, the patch is heat sealed and attached to the garment with Velcro, for precise positioning and easy removal. These patches work great on jackets and uniforms, extending their life and giving them some flair.